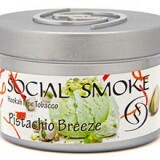 Social Smoke Pistachio Breeze | HookahRev.com | Hookah, Simplified. Smells Like:: Creamy, nutty, and sweet. Think in the category of flaky pastries. 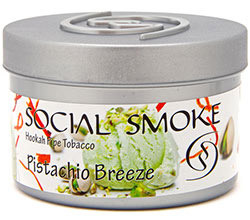 Very unique flavor, tastes like an unsalted pistachio, with a creamy vanilla, and a hint of saffron. As stated before this is a very unique flavor, but it may be too unique. We had found that you definitely have to be in the mood for this, or else it won't satisfy the way it should.